The top twelve organized crime activities in Bulgaria generate some BGN 3.5 B (EUR 1.7 B) annually, according to a report of the Sofia-based NGO Center for the Study of Democracy (CSD). Thus, the combined turnover of the criminal and gray economy in Bulgaria is some 4.7% of the country's GDP, says the report entitled "Organized Crime Threat Assessment in Bulgaria 2010-2011". The paper was presented at a public discussion at the Bulgarian Parliament featuring CSD analyst Tihomir Bezlov as well as Bulgaria's Interior Minister Tsvetan Tsvetanov and Interior Secretary Kalin Georgiev. "Today we are talking about assessment of the threat from serious organized crime, not some much about counteractions to," Bezlov stated, as cited by BGNES. "The model we have used is based on analyses and data from the major Bulgarian institutions, and this is the first time we had such a wide access to information. During the 1990s there was a lot of violence – murders, including gangland murders, explosions. But in the recent years there have been a substantial decline in violence," he added. 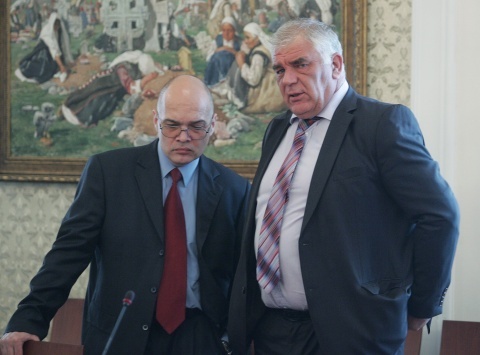 According to the think-tank, the connections between white collar crime and organized crime are a major threat to Bulgaria. "Corporate crime – known among the public as "oligarchy" is especially threatening in this respect," Bezlov explained. The report has found that "sexual services" market has the largest criminal turnover in Bulgaria amounting to about BGN 1.26 B annually; at the same time, however, it is said to be "shrinking". The report also focuses on human trafficking, contraband, drug trafficking, VAT fraud, the illegal cigarette market, the illegal fuel market, money laundering, and money forgery, among other criminal activities. "We have outlined eight threats in our report, which stem from both specific criminal groups, and from sources connected with legislative and institutional problems," stated in turn the Chair of the Board of the CSD Ognyan Shentov. According to the NGO, Bulgaria's domestic drug market has an annual turnover of about BGN 350 M, while VAT fraud is estimated at BGN 700 M.
"The perpetrators in this type of criminal activity enjoy a high social status and public influence since many of them also participate in the legal economy. After VAT fraud peaked in 2008, there has been a decline of some 30% as a result of the economic crisis and the increased pressure by the Interior Ministry, the National Revenue Agency, and the State National Security Agency," the report concludes. Yet, the VAT fraud losses of the Bulgarian budget are estimated at about 10% from all VAT income. The fastest growing illegal trade in Bulgaria, however, is the illegal cigarette market, which tripled in just three years, reaching about BGN 500 M in 2010, or up to 40% of the entire cigarette and tobacco products market. It is said to enjoy about 500 000 consumers and a criminal network of some 15 000 distributors. According to the CSD, however, this market saw a 20% decline in 2011. Bulgaria's illegal fuel market is said to be roughly equal in volume, with the state budget losses that it incurs amounting to BGN 600 M from excise evasion, and BGN 470 M from VAT evasion. "The income from criminal activity retains its high levels regardless of the economic crisis. Most of the criminal networks in Bulgaria control legal business organizations which facilitates money laundering. As a result, the organized crime penetration rate into the legal economy is considerably greater in Bulgaria than in Western European countries," the CSD report concludes.